Business processes and decisions are the backbone of every company, from the small to the Fortune 50; it is how the business runs. It is these processes and decisions that can create competitive advantage, help a company react more quickly to changing trends, or drag them down because the processes do not serve the business and allow agility. The first step in building business agility is to understand how the business works today; What are my processes? What are the decisions we are making and how do we make them? Understanding these processes and decisions can allow a company to improve, streamline, and increase efficiency. Capturing business processes can be a daunting task. Adding to that burden is learning the tool of choice for capturing those processes. 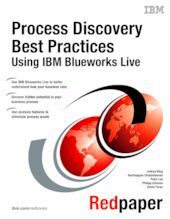 This book helps the audience ramp up more quickly to a fully functional process analyst by explaining all of the features of IBM Blueworks Live™ and how best to use them. This IBM® Redpaper™ was written with a non-technical audience in mind. It is intended to help business users, subject matter experts, business analysts, and business managers get started with discovering, documenting, and analyzing the processes and decisions that are key to their company’s business operations.